With each new update of the Chrome browser, Google brings something new to the table. 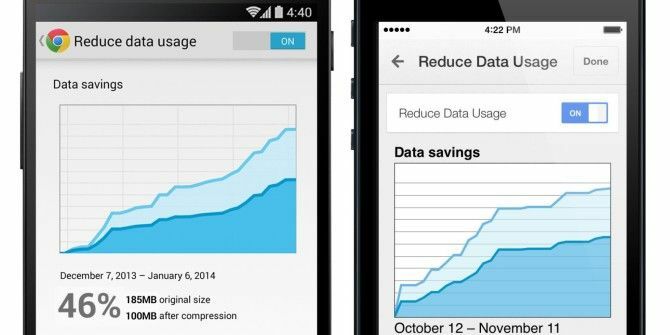 Chrome 32 for mobile has a significant new feature though: the ability to automatically reduce your data consumption. Additionally, Android users can create shortcuts to websites on the homescreen and iOS users get a taste of the Translate feature. Meanwhile, Chrome 32 for Android also brings the ability to create shortcuts to websites from your homescreen. When you are browsing a website on Chrome, head to the menu and choose ‘Add to Homescreen’. It’ll appear as an app icon, which you can tap to open the site either as a full-screen browser or as a regular Chrome tab—it depends on the site at the moment. And finally, while Android users have enjoyed the Translate feature Google Translate Android App Makes Translated Conversations Simpler Google Translate Android App Makes Translated Conversations Simpler The Google Translate app could be the “universal translator” you were looking to break all linguistic barriers while travel hopping. It adds enhancements which help to have translated conversations. Read More by default in Google Chrome, that feature will now also be available to iOS users. Just wait for the translation bar to pop up, like it does on your desktop browser, and hit the ‘Translate’ button. Google Chrome 32 for mobile will be rolling out in the next few days on the Google Play Store and iTunes App Store as a free download. This means more hoarding of your data. Google is too powerful and EU needs to fine them very hard. No they don't, they hoard your data because they want your data to be small and cheaper. They are making a free service just for you to enjoy. Do you really think that Google employees can see what you are doing in a hundredth of a second before another request comes? Not at all. Google does not have the processing power or hard drive space to store your information because their is too much to deal with. The EU can reward them for giving free services to everyone so they can do more on the Internet.